Liberals these days seem to have no use for the concept of free speech. On Wednesday, A&;E suspended Duck Dynasty's Phil Robertson because of his christian belief on homosexuality. As a result of A&E's actions, supporters of Duck Dynasty and free speech have decided to boycott the network until it lifts the suspension. Twitchy said Wednesday a Boycott A&E Twitter account was established. As of this writing, that account has over 11,000 followers and growing every hour. "Freedom of speech is not just for liberals," the account said in one of its few messages. The account also posted a picture that reminds readers A&E forgot that Robertson said he would "never treat anyone with disrespect" simply because they are different from him. 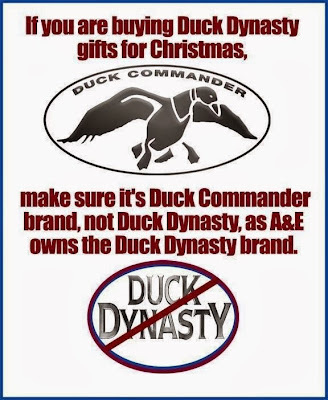 A&E, the network that airs “Bates Motel,” the series “The Killer Speaks,” and in the past aired “Growing Up Gotti,” and “The Sopranos,” has deemed “Duck Dynasty” star Phil Robertson unsuitable for its broadcast because of an interview answer where he paraphrased Corinthians 6:9–11. That’s where they draw the line???Right!! This has nothing to do whether one agrees with the gay lifestyle or not, this is freedom of speech, and if one is christian, they have a certain code they go by, and it comes from the bible, might not agree with it, as some do not agree with the gay lifestyle, but you have to respect other peoples opinions, it's call democracy. The left wing media calls it a anti gay rant, it was not a rant it was an opinion, there are plenty of anti gay rants out there, and I would suggest the media tell the truth for once and look it up...big difference. Anyway. as I said before, this has backfired on A&E, the support for P. Robertson's right to free speech is defended by the majority, a lot do not agree with his comment, but as American tradition shows, free speech is to be regarded as a no touchy. If anything the gay community should come to the defence of Phil Robertson, "we do not agree with what he said, but totally defend his right to his opinion". They asked him a question and he went by the scriptures, he did not Judge. Don't ask a question if your Politically Correct ears are not prepared for an HONEST and TRUTHFUL response. CONVICTION to have the COURAGE to speak YOUR TRUTH, that IS Integrity, and is NOT HATE SPEECH. Divide and Conquer, oldest strategy in the books, and people are too thin skinned and unthinking to see it.